Nine-hour drives, doubleheaders in 97-degree heat and no air conditioning at an inconspicuous team motel. . . .
It’s wasn’t the most luxurious 450-mile road trip to Healdsburg in Sonoma County, but the Conejo Oaks baseball team wouldn’t spend the dog days of summer any other way. Midway through the California Collegiate League summer season, the Oaks (6-10 overall) are trying to hone their skills before returning to their respective college campuses. This year’s team has 13 ballplayers with local ties. Dylan Francis, an incoming senior right-handed pitcher at Cal Poly Pomona, graduated from Thousand Oaks High in 2013. He last spent a summer with the Oaks three years ago. 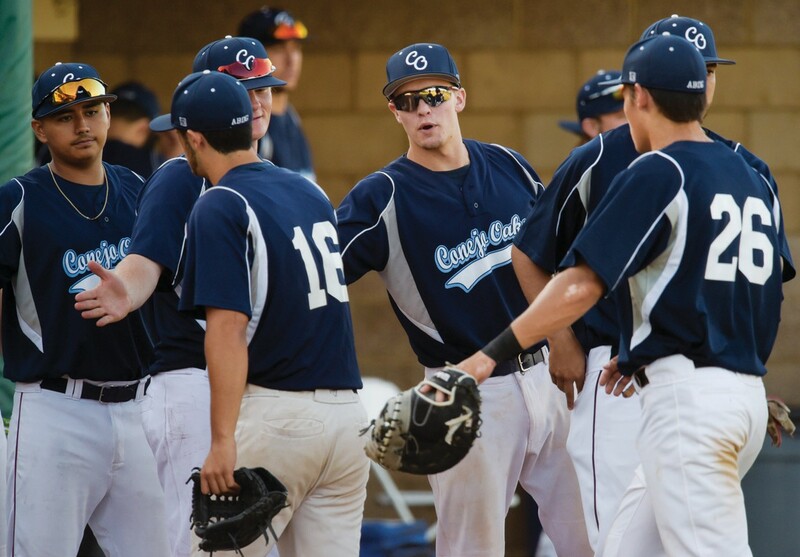 TEAMWORK—The Conejo Oaks will play the OC Riptide at 4:30 p.m. today at Cal Lutheran’s Sparky Anderson Field in Thousand Oaks. The Lancer said he’s delighted to reunite with former high school teammates Bailey Holbrook, a corner infielder, and Jackson Simonsgaard, a left-handed pitcher bound for Rogers State. The 24-year-old, who spent time at Western Nevada, Oxnard and Ventura colleges after high school, is coming off an impressive junior season at Pomona, in which he maintained a 3.80 ERA as one of top starters on team. David Soliz, the Oaks’ eighthyear skipper, said Francis is looking good on the mound at Cal Lutheran, the team’s home field. David Appleby, a 2015 Agoura grad, has also pitched well this summer. 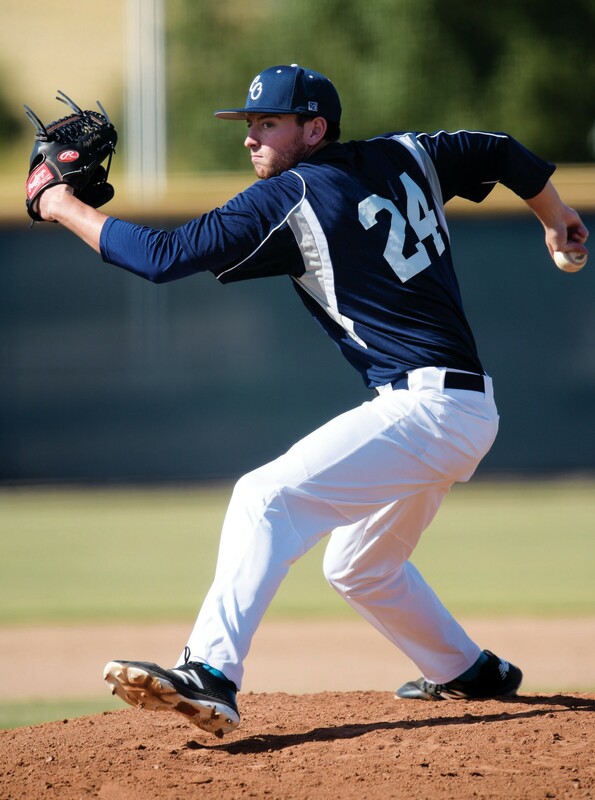 He spent the past two seasons throwing at Santa Barbara City College. He’ll be a junior economics major at Michigan this fall. Appleby said he was surprised to see so many friends and former foes on the Oaks this summer. “When Bailey (Holbrook) showed up the first day, that was the first time I’d seen him since we played against each other (in 2015),” Appleby said. Holbrook, 20, spent two years playing at Union University after graduating from Thousand Oaks in 2015. Eddie Kutt, a 19-year-old entering his sophomore season at Ohio University, and Bo Jelinek, an incoming sophomore at the University of San Francisco, are right-handed hurlers who prepped at Westlake. Fellow Westlake graduate Bryce Vitt, who stars at catcher, most recently played at Pierce College. Kutt, an environmental science major at Ohio, maintained 3.60 ERA with 40 strikeouts and 17 walks in 50 innings for the Bobcats this season. Alexander is one of three Scorpion alumni on the Oaks roster. The 19-year-old reunited with fellow Camarillo graduates Andrew Lucas, an incoming freshman at Cal State Northridge, and Ramon Gomez, an incoming sophomore at Oxnard College. Alexander batted .281 in 52 games, racking up 54 hits, 23 runs batted in, 13 doubles, four triples, four homers and three stolen bases in his first season in the Lone Star State. Johnny Lavallee, a Royal graduate who won a CIF-Southern Section boys’ water polo championship in 2016, is an Oaks right-handed pitcher. He plays at Pierce College. Aidan Dolan, a 6-foot-2 pitcher who hails from Oak Park, prepped at Chaminade. Zach Kaminkow, a freshman catcher at UNLV who used his medical redshirt to have shoulder surgery last year, played his first two prep seasons at Simi Valley before transferring to Chatsworth. Despite the rising temperatures and occasional road trips, the 18-year-old communications major said he’s glad to use his summer gearing up for a position battle at UNLV.